We are a leading Manufacturer of portable pipe threading machine and portable pipe & bolt threading machine from Ludhiana, India. A good Portable pipe threading machine will give you hassle free service for years, and will ensure that the functioning in the unit is without any frictions. It will also make sure that with minimal care and resources, the portable pipe threading machine offers an output that is high. Since these portable pipe threading machines are manufactured using high grade material, it is not only able to brave abrasion and breakage, but also prolonged wear and tear. 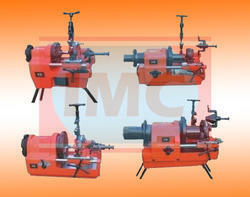 At Industrial Machinery Corporation, the pipe threader can be customized as per the requirements of the customers. Pipe Threader offer in variable sizes for models, specifications based on power consumption and revolutions per minute, sizes of the die-heads that are a part of the machine and total weight of the pipe threader. Once you have considered all these aspects, it would be an easy enough matter to choose a Portable pipe threader that is ideal for your unit. It is important that at the time of picking up a portable pipe threaders, one keeps certain factors in mind. These include aspects such as, what is the material that has been utilized for the fabrication process of the portable pipe threader. Some of the signs of a good and reliable portable pipe threading machines would be that it incorporates features such as a resistance to abrasion and water. 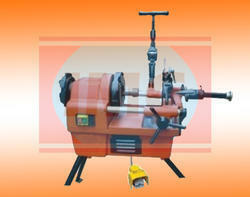 The portable pipe threading machines have been built to withstand wear and tear as well as breakage. This ensures that whoever invests in this portable pipe threading machines, receives full value for the money spent. IMC-1/2" to 3" IMC-1/2" to 4" IMC-2.1/2" to 6"
Sizes For Pipe Threading (Inches) 1/2" to 2" 1/2" to 3" 1/2" - 4" 2.1/2" to 6"
Threading Die-Head Included (Inches) 1/2" - 2" 1/2" - 2" & 2.1/2" - 3" 1/2" - 2" & 2.1/2"- 4" 2.1/2" - 4" & 5"- 6"
2.1/2" -4" 2.1/2" - 4" & 5"- 6"
A portable pipe and bolt threading machine is more often than not, fitted with a system that is truly advanced. This allows for the machine to function not just smoothly, but also in a manner that is hassle free. High level quality processes and constant checks also ensure that the amount of money and time spent on maintenance is minimal. Apart from this, there is also the guarantee that the ultimate output offered will be on the higher side. Some of the signs of a good and reliable portable pipe and bolt threading machine would be that it incorporates features such as a resistance to abrasion and water. The machines have been built to withstand wear and tear as well as breakage. This ensures that whoever invests in this machine, receives full value for the money spent. Companies like Industrial Machinery Corporation offer portable pipe andbolt threading machine that are fabricated in accordance with the specifications provided by the customer. These include sizes for pipes, bolts, conduits etc. Model No. IMC-PPBTM-1/2" to 2"
Sizes for Pipe (Inches) 1/2" to 2"
Dies Including (Inch.) BSPT or NPT 1/2" - 3/4" & 1 - 2"
Approx. Wt. of the Machine 62 Kgs.